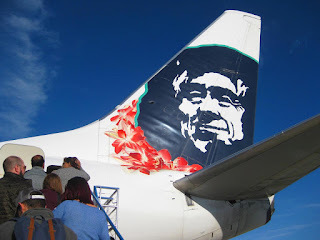 Alaska Airlines has received the U.S. Department of Transportation’s tentative approval to serve Mexico City’s Benito Juarez International Airport (MEX) from California’s three largest cities, which are all major hubs for the Seattle-headquartered carrier. While a specific date has yet to be set, the airline expects flights from San Francisco International (SFO), Los Angeles International (LAX) and San Diego International (SAN) to start this summer. Tickets and flight schedule details will be announced at a later date, following final government approval. "Service to Benito Juarez International Airport … gives our valued guests access to the largest metropolitan area in the Western Hemisphere," John Kirby, Alaska Airlines VP said in a statement announcing the tentative OK.
Alaska previously served Mexico City from 2005 to 2015. After it receives final approval, the airline will commence year-round nonstop service with daily flights between MEX and SFO, and MEX and SAND, and twice-daily flights between MEX and LAX. Flights will be operated using Boeing (NYSE:BA) 737 and Embraer E175 aircraft. According to SeatGuru.com, First Class seats aboard the airline’s 737s are 21 inches wide with 36 inches of pitch. Economy seats are generally 17 inches wide with between 31 and 35 inches of pitch, depending on the specific aircraft’s configuration. E175 aircraft have First Class seats that are 21 inches wide with 36 inches of pitch, Premium Economy seats that are 18.25 inches wide with 36 inches of pitch, and standard economy seats that are 18.25 inches wide with 32 inches of pitch. On board, guests will have access to Alaska Beyond Entertainment, which offers free entertainment direct to customers' own devices. Other on-board amenities include a selection of food and beverage inspired by local chefs, custom leather seats with adjustable headrests, and power outlets throughout the cabin, the airline noted. When service resumes, Mexico City will be the ninth destination in Mexico that Alaska serves from California. Others include Cancun (CUN), Ixtapa/Zihuatanejo (ZIH), Loreto (LTO), Los Cabos (SJD), Manzanillo (ZLO), Mazatlán (MZT), Puerto Vallarta (PVR) and Guadalajara (GDL). Alaska began flying to Mexico in 1988 and at present operates 96 flights a week, which is more than any other U.S. carrier offering flights from California. Alaska Airlines, Virgin America and Horizon Air are subsidiaries of Alaska Air Group (NYSE: ALK).